If you are on blogspot or wordpress platform, you must have configured your blog with google feedburner email subscription tool right ? and I'm sure blogspot users have also configured, automatic sharing of blog posts to google plus. But are you on twitter ? If yes then you must configure your blog with "auto tweet your blog posts" feature from feedburner. If you are confused and wanted to see, how to automatically tweet blog posts using google feedburner then you are at the right place. Feedburner is the free email subscription service provided by google and I hope every blogger is using it. Couple of years back, google added "tweet automatically" feature in feedburner. So now whenever you publish any post, the link will be automatically posted to twitter (by feedburner) with proper hast tags. Step 1 :- Login to your feedburner account. 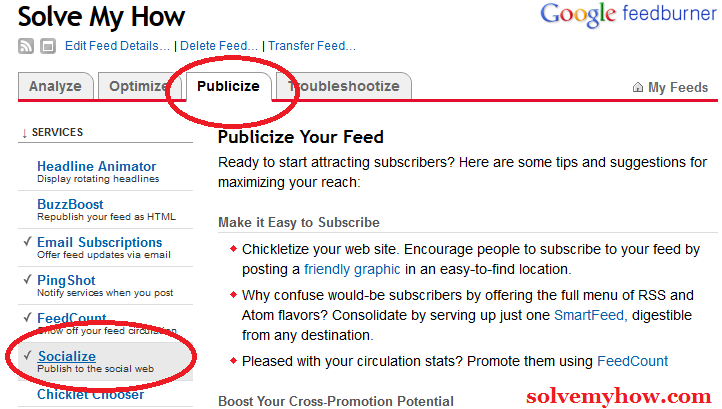 Step 2 :- Click on your blog's link and go to publicize tab. Step 3 :- Now go to publicize tab. In publicize tab you will find several option but you just click on "socialize" tab. Step 4 :- click on "add a Twitter account". Here you will find one button i.e "add a Twitter account". Simply click on it and you will be redirected to an authorization page, where you have to authorize feedburner with your twitter account. PS: you can see the snap shot below, I had already authorized my feedburner account with twitter (@piyush036) and now whenever I publish my post, feedburner will do automatic tweets for me. Step 5 :- Setting formatting options. Now just below "add twitter account" button there are some formatting options which you need to setup. In this you will find 3 options i.e title only, title and body and body only. Select your suitable option whatever you wanted to tweet. I selected title only. Now, make sure "include link" and "leave room for retweets" is checked. 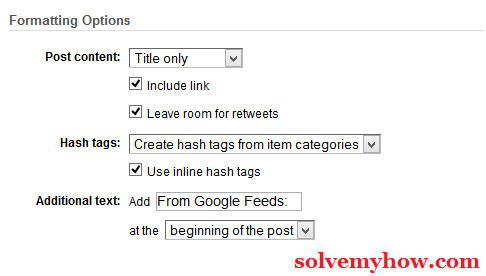 Here you will find 2 options i.e create hash tags from item categories and don't add any hash tags. So, I went with the first option and it is recommendable because twitter is all about hash tags right? So, whatever your "post labels" are will become hash tags. 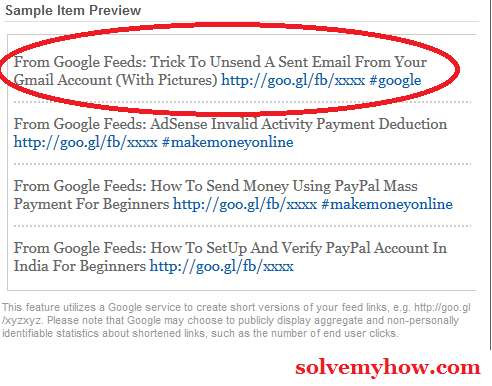 For example: this post's label is "google" so it will tweet title and link with #google tag. Step 6 :- Setting item Selection. Here I recommend you to keep everything as it is else you can set item limit, item order and keyword filter. Step 7 :- Look at "sample Item Preview". Step 8 :- Click on "Active" button. Now finally click on activate button and you are ready to tweet your blog posts automatically. So this was the complete tutorial on how to automatically tweet blog posts using google feedburner. I personally found this feature very usefull as I used to get many re-tweets just because of this. I tried to explain it in very basic steps, hope you found this tutorial worth reading and informative. 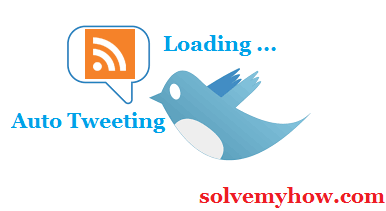 You can connect with me on twitter @piyush036 and you can also subscribe for SolveMyHow newsletter to get free updates on blogging, SEO and make money online tips right into your inbox. Do let me know which tools you are using to auto tweets your blog posts.